When summer rolls around I can pretty much live off tacos. 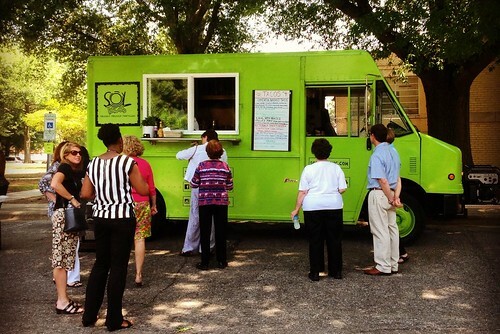 Thankfully my friend Art over at the Wandering Sheppard shared the news earlier this spring about a great new food truck called Sol Tacos. It’s a gourmet food truck that serves southern inspired tacos using soft hand made tortillas filled with locally sourced southern organic ingredients that compliment classic Mexican street food. 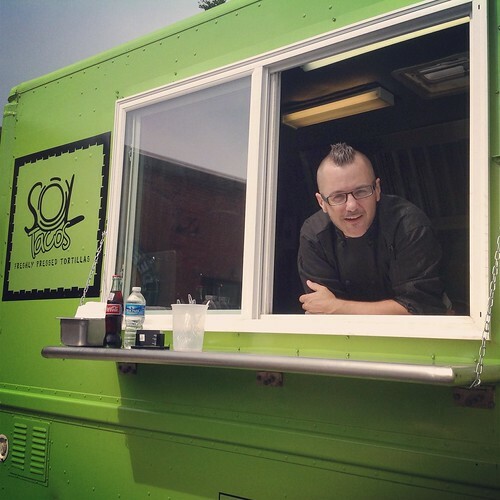 The truck is based out of Cary and operated by chef Andy Schaumann (follow him on twitter @Sol_Tacos). Schaumann has a long history of working in great restaurants having most recently worked at well the known Vivaci in North Hills. You can tell he pours his heart & soul into his business and it really comes out in the culinary creations he serves from the truck. 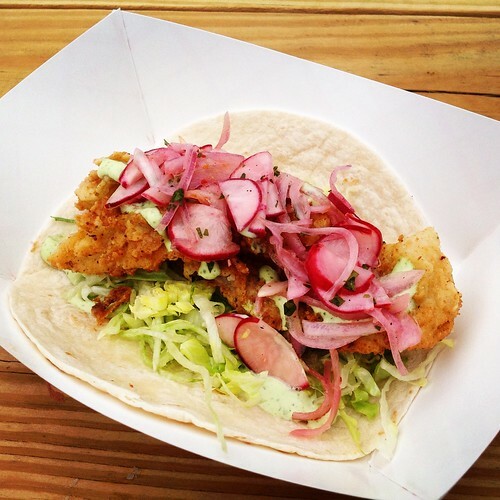 When I first visited the truck the daily tacos being offered included a Buttermilk Fried flounder taco with cilantro sour cream, lettuce, and citrus radish salad. Other offerings include a blackened chicken nacho taco and the cheddar chuck burger. I’m a big fan of the fish taco but look forward to trying the chicken nacho taco next! 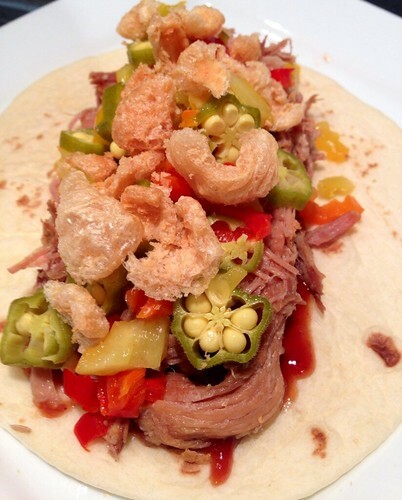 A new addition to the taco menu this 4th of July weekend is a special pork taco made with local beer braised pork, pickled okra, hot banana peppers, chicharones, and western BBQ. Sol Tacos also features a selection of creative sides that rotates seasonally. 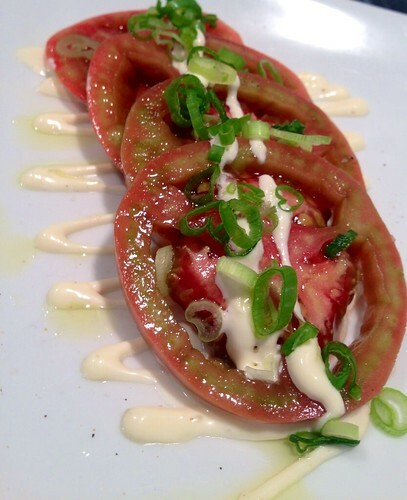 This week’s side items include local sliced heirloom tomatoes from birdland farms with lime aioli, maldon sea salt, balsamic, and olive oil. Another new offering is the “personal nachos” with organic corn chips, ground chuck, black beans, shredded cheese, queso dip, tomato salsa, sour cream, hot sauce. 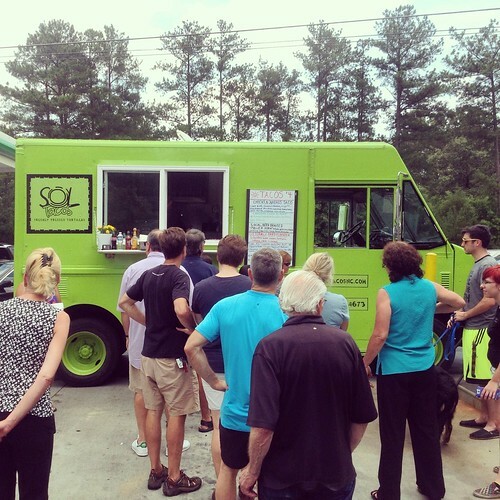 You can find the bright green Sol Tacos truck this fourth of July weekend all over the Triangle. Starting on Thursday night (7/3) at Deep River Brewing in Clayton, Friday (7/4) at Knightdale Station Parks fireworks celebration, Saturday morning (7/5) at Apex Farmers Market, & then Sunday (7/6) at Raleigh Brewing Company. To keep tabs on where the truck will be next and visit their monthly calendar here.